-- Danilo Pelletiere, research director, National Low Income Housing Coalition. “The Marathon was better than ever this year. We were proud to be a part of it! -- Ben Michael, GM, WESU, Middletown, CT.
-- Joe Barton, formerly homeless participant. -- Kay Rowe, formerly homeless participant. -- Rachel Hester, executive director, Campus for Human Development. “I really was grateful to the broadcast and excited about the whole entire endeavor. Being that we were one of the sponsors and part of the process of sharing nationally, I like to think that it was beneficial not only for the homeless on the streets but also to bring more awareness of the various types of conditions our brothers and sisters are faced with every day. Hopefully there was a seed planted that will in the future help us to give more hope and support to the homeless community. “The Homelessness Marathon put a national spotlight on the barbaric way the homeless were treated in this community. As a result, positive changes have taken place. Homeless advocates and representatives from the city have begun a dialog that have resulted in improving the living conditions for the homeless. “The Homelessness Marathon gave the homeless an opportunity to speak directly to this communities decision makers. This was the first time our mayor and other elected city officials have ever attended a town hall meeting where they were held accountable for their actions by the homeless. This experience empowered the homeless and made a big impression on the elected officials. “Having the Homelessness Marathon in Fresno brought together, for the first time, the homeless advocates in this community. The project empowered the homeless, unified the advocates, and put the fear of God in the hearts of the architects of this city’s failed policy on homelessness. -- Rich Dirck, development director, WSCA, Portsmouth, NH. -- Big Sue, homeless participant. -- KFCF president Rych Withers, when asked if he would like to be the Marathon’s head engineer again next year. "Appearing on the Homelessness Marathon was a true learning experience for me. People walked up to the mic and explained in plain language why they were homeless, and most of it had to do with losing a job and being unable to pay the rent, which can happen to any of us. The Marathon put a human face on something that too many turn their backs on as an aberration." "The homeless and those who act on their behalf need to have their voices heard more often discussing important issues that impact the well-being of these citizens. The Homelessness Marathon is an effective radio program that deserves a broader listening audience. I look forward to listening to this broadcast every time it is on the air. It really needs to be aired more than once a year." "You guys do a great service, and we were glad to take part. Please keep us in mind for next year!" "The Homelessness Marathon forms a vital part of the effort to bring more awareness to the tragedy of homelessness. We are proud to have participated in the Marathon, but we look forward to the day when it is no longer needed." "This was a pretty incredible experience for us at Columbus house, staff and guests alike. I believe that the folks who were on the air with you stretched beyond their immediate experience of the shelter to speak on the larger issues, which was profound for them. and for me. You all have such a commitment to this project and to the people for whom/with whom it is aired. I hope I/we can be a part of it again next year." "There is nothing more important than low-income and poor people finding their voice. The Marathon is an annual exercise in providing people the opportunity to speak out." "KPOO was honored to be a part of the Homelessness Marathon for the 2nd year. Of the 14 hours, I listened to about 12. You are doing an excellent service. "Listening to the Marathon brought together for me the uniqueness of the broadcast. The audience member cannot use the visual 'picture' of homelessness to stereotype the homeless person. You don't 'see' a dirty person or an alcoholic, the unshaven or unbathed, so the audience must use just the voice of the person, and that gives the voice validity and truth that impacts the audience greatly. How can you not be affected? It is critically important for the public to understand what is and is not happening and how we need to redouble our efforts to reduce homelessness and provide people with a roof over their heads. The Homelessness Marathon helps keep this issue before us. And anyone who does this, I think, deserves a round of applause. "I really enjoyed your marathon. It kept me awake all through the night, not because I was afraid the sound would cut off and I'd have dead air but because you had so much great information and interviews set-up on this issue of homelessness. I wondered how you were going to fill 14 hours but it turned out there are so many connections to other things you could have probably gone another 14. What you put together is greatly appreciated and so important. "Thank you for your efforts in bringing greater awareness to the general public regarding homelessness issues. This is the first I have ever heard of the Marathon, and I was BLOWN AWAY to hear it on the radio. You have no idea... to really hear myself represented in such an honest way was like a re-birth of some kind. I felt validated as a human being, and that's something that occurs very seldom among the homeless. Again, THANK YOU. "You repeated several times that one of the goals of the Marathon was to open up a dialog about homeless issues. I guess I felt like it was more of a conversation, and I was wanting to participate in it in more of an ongoing fashion, so I called several times. Thank you for not silencing me, even as a repeat caller. Each guest you presented brought a unique perspective to the issues, and I could identify with every one of them. Not only did my cloak of invisibility drop for a time, but I felt a part of something... a movement, a step in the right direction.
" No one is going to solve the problem in one night, but you gave us a voice. And that's an important thing. Keep the fire burning. I'll be listening for you next year." "I thought it was great - it provided an opportunity for homeless and formerly homeless people to discuss the experience and as important, for housed people to hear and better understand this phenomenon -- ultimately building awareness and political will to deal with the shortage of affordable housing and the imperative to meet the housing needs of all people." "The Marathon generated more interest and conversation than I would ever have imagined. I think that it got folks thinking about the issue in renewed ways. Locally it helped to put a face on the generic" homelessness." There was also a great deal of spark from hearing from other parts of the country. Blessings on your work." "We've gotten a lot of positive feedback from our listeners about this marathon. It was our second year airing it, and we plan to continue airing it as long as you provide us with the opportunity. Some listeners called up during certain music shows (that were pre-empted by the Homeless Marathon broadcast), and although they missed the music they were accustomed to hearing each week on that program, they also thanked us for caring about issues such as homelessness. It really makes our executive staff feel as though we are doing our part in "giving back" to the local community." "The Marathon gave us a chance to share for just one night what it means to survive without the basic things that so many in our society take for granted, things that too many of us must go without. Best of all, the Marathon gives us all a voice, shining a bright light on what is all too often swept aside, a voice that confronts one of the most blatant violations of human rights that is homelessness in America." "We have used the Homelessness Marathon as part of our programming for a few years now and we've always gotten a good response. As a matter of fact, this year, WRFG would like to increase our participation, and we're looking forward to beginning to work on it." "When I was listening to the show from other states, I was reminded that there's safety in numbers, and that working together we can help each other get back on our feet. I thought the Marathon was great!" "The 2003 Homelessness Marathon was the first nation-wide project that I became involved with as the station manager for WZRD. I approached the project with a highlighted sense of duty, not only because I feel that it's WZRD's responsibility to inform and educate our listeners as best as possible, but because the subject matter was eerily familiar -- I had been homeless myself once. "As fortunate as those of us are who have a home, we're all that much more fortunate to have you in our corner, speaking and doing, not only on behalf of the many homeless, but on behalf of us all. "If the Homelessness Marathon helps just one listener to better understand this horrible plight each time it's aired, and convinces that one to get involved in eradicating it from our society, you've done well. I know though, for a fact, that many more are ready to get involved, due to the response from our listeners, many of whom listened to the entire broadcast. -- God bless you!" "This was the first year that KZYX participated in the Marathon and, being a new experience, I wasn't sure what to expect. Both station personnel and listeners were fascinated hearing the voices and stories of the people who were brought on. I think it really helps to dispel the stereotypes we have of the people who are homeless. And "Nobody" was incredible at keeping the pace of the show moving, helping people to get to the point and very tactful and compassionate in dealing with the difficult ones during open mic call-in. In fact, I've thought about excerpting some of the marathon to highlight his techniques for our programmers who take live call-ins." "Homelessness is a big concern in KUSP's listening area, so we've been glad to air the Homelessness Marathon the past couple years. The national broadcast of the program gives light to the fact that homelessness happens everywhere, and provides an opportunity to focus some of our local programming on what's happening specifically in our area. I look forward to watching the Marathon grow in the coming years." "Nice work and thanks for providing such a great public service!" "I very much enjoyed the program, it was amazingly fast paced in spite of the length, it could have gone longer! I got several calls the next day from listeners, one gentleman in particular told me he ended up staying up all night to listen! I also appreciated hearing from the Native American couple, and loved the poetry. Also got a lot out of the rural segment in the morning. We followed the marathon on Wednesday morning with some local interviews regarding homelessness. All in all, I would call it a success, I only received positive comments, and again, it was well done, not boring, an emotional ride, one that at times made me laugh, and at times made me cry." "The Homelessness Marathon provides our community the opportunity to focus on homelessness from a national and local perspective. By speaking with local service providers and homeless people, we become better informed about what is being done and what individuals can do to help those in need in our area. The national dialogue unites us as a human family. We can measure our own situation by hearing about the concerns of people in other cities." amazing. On behalf of the entire WERU community, thank you." "WMPG in Portland has aired the Homelessness Marathon for the past two years. We've been inspired by the event. Inspired because the marathon presents not only the facts, it also takes us inside the world of homelessness. Our station is committed to airing quality, meaningful programs like the Homelessness Marathon. We are so inspired that we are planning to broadcast the marathon from an outdoor studio set-up here in Maine next year." "I thought the show was excellent, and addressed homelessness on many fronts and helped fight the stereotype that all homeless people are alcoholics/drug users or bums. Interestingly enough we only got three phone calls complaining or asking about us preempting our regular programming. Usually when we pre-empt the Grateful Dead Show, we find the phones ringing off the hook, so I suspect that most of our listeners understood the importance of what was being aired, and I'm glad that KFCF could participate this year and that putting the feed up on the KU made it available to a wider audience." "Thank you so much for choosing Cambridge as the site of the fourth Homelessness Marathon. It was a pleasure to work with "Nobody," and an inspiration to those of us who work "on the front lines." In a nation where the poor and the homeless are often depicted as something despicable, it is wonderful to have the opportunity to tell our stories and, hopefully, to get the message out that the homeless are people like everyone else, but don't happen to have a place to live." "It was a special event, almost a party, but people showed great respect for each other. There was a lot of talk amongst the guests about issues of homelessness. It was a wonderful environment with participation from people all over the country: the young, old, disabled, also people active in the Department of Mental Health, even college professors and a rabbi from Florida. I have a section 8 voucher and will now try harder to get out of the shelter and into housing. This night has given me more perspective on my situation. I fell down the stairs tonight -- I still have a problem -- but I feel more empowered because of tonight. Because of the solidarity and issues addressed, I saw that we were all in the same boat." -- Charles Swenson, homeless "Spare Change" vendor with multiple sclerosis, Cambridge, Massachusetts. "It was an amazing feat. I was impressed with the show and really glad that we aired the 11 hours that we did. I had some good listener feedback -- one woman who is a longtime listener and supporter called me at 6am just as I came in and turned from the marathon back to our morning news, saying "I'm so proud of WJFF for airing this!" Two other listeners told me that their children were riveted to the program, giving them each a great opportunity to have a discussion on homelessness. Two of our volunteers came in and built a shelter outside in the middle of a storm and slept there for the night, coming in to do station ID's. We'd definitely be open to carrying it again! "It's what community radio can do best, when communities of all sizes, shapes, colors and perspectives put themselves out on the streets to hear what happens. In a society that wants to look the other way most of the time, the Homelessness Marathon stares straight at the situation. Overall the comments were positive and the Program Committee was impressed. I particularly found much of it evocative, perhaps because some of the callers, who've gone much of their lives being spit on by society, found advocates and kinship with the co-hosts and listeners. "In no way is this a perfect radio program, but then, being homeless is far from the perfect situation in a society that develops amnesia when it comes to the homeless. Still, our listeners were engaged, enraged, and enlightened -- when we repeated some of the overnight stuff in prime time two days later, they called and wanted to be part of it, though the show was over." "The Homelessness Marathon is an impressive effort and includes a wide range of topics and viewpoints. We heard perspectives from homeless people, social service professionals, elected officials, listener call-ins from all over the country...many voices. In the hour before we joined the national broadcast, our station did a program focused on homelessness in our area. It was an easy and effective local tie-in to the marathon. "I went home later, got into my warm bed and listened well into the night. I didn't sleep very well." "The voices of homeless people on this marathon gives the public a real education, and that's the only way things will ever change." "A superb idea and a great project." "We think this is a very valuable program. It created a lot of interest with our listeners when we ran it. One of the "local" tv stations came and did a story about it, and that's not easy. They had to come from sixty miles away." "Talk radio at its finest." "The show went great. Loved your guests and the call-ins were very successful...It was a great event, and we thank you for the opportunity and pleasure to participate. Count on us next year if you do it again." "The marathon is one of the best methods of making people aware of the real deal. The marathon participants tell it like it 'tis." "It's critical that a broader segment of our society understand the suffering homelessness imposes and the denial of its systemic causes that we perpetuate as a nation. The insight that the marathon provides plants the seeds of an America that finally commits itself to trying to bring everybody home again." "It was great, and it helped us invigorate our connection to homeless issues in Portland." I am the Editor and Publisher of a Street Newspaper in Los Angeles, that is co-operatively run by homeless and formerly homeless people which publishes articles, poetry and artwork by homeless people about homelessness and poverty. This newspaper is distributed by homeless people to educate the housed public about poverty issues from homeless people's perspective. I would like to implore you to consider supporting the Homeless Marathon spearheaded by Jeremy Alderson. It is important that homelessness in America get the attention it desperately deserves. I, and a number of homeless people in our area have participated in past Homeless Marathons speaking to America about our collective experience. It is the only forum we've had to answer the questions America has about our situation, and to talk about the ways we feel we should be helped. It showcases homeless talent, dramatizes our experiences and gives us hope that someone hears us. Homeless people have little financial means to garner such publicity about our plight. Please support Mr. Alderson and his efforts to make the Homeless Marathon accessible to the American public. We are depending on professionals in the media to help us end homelessness and poverty through education provided by radio broadcast stations. 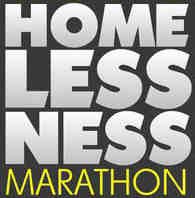 The Homelessness Marathons have been recognized as historic broadcasts by libraries around the country. Tapes of the marathons have been archived by libraries at Harvard, Stanford, Cornell, UCLA, Berkeley, the University of Chicago, NYU and many other institutions of higher learning.